Penguin Greatness: Real Shades of Mario. In the early 90’s growing up as a young Penguins fan, I learned a few things about hockey that will live in me for the rest of my life. My friends and I watched every Penguins game, called each other during the game, and spent hours the next day at school talking about the game. I learned the importance of skill players, players who play with grit and determination, and players who fight. I also learned how these players react in different times of the season and in the playoffs. But the most important thing I learned was how the superstars of the National Hockey League shine in the most important parts of the Stanley Cup Playoffs. We all knew growing up how great Mario Lemieux was at scoring goals and setting up his teammates. We saw his skill on a nightly basis in the early 90’s. While in awe of his talent did you ever stop and watch him lead his team to victory by his shear will and power? Just his look while on the ice meant something to his team, the only emotion was towards winning. When I see videos from Mario from the early 90’s I see the true great leader that he was. I watch his face, his demeanor, and his reactions to his great play. When he scores its all business, he gives his teammates high fives and then its back to work. 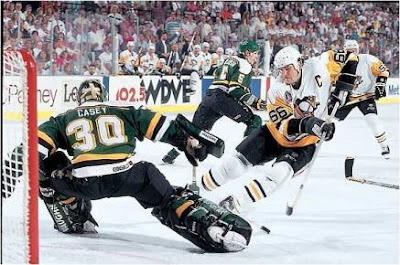 Plain and simple you weren’t going to stop Mario and the Penguins when Lemieux had this look. While watching game seven in the Penguins vs. Capitals series I saw that look again, Sidney Crosby had that look. 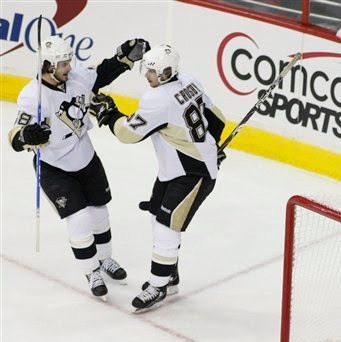 When everything was on line, and the team had to win, Crosby took the team and led them to victory. This hasn’t been Crosby’s best season, yes he finished 2nd in points to Evgeni Malkin but I always felt Sid had another step to take before becoming the leader we all knew he good be. The Pittsburgh media started to question if this wasn’t Malkin’s team. Sid never really seemed to score the big goal when we needed it, missing the net or being stopped when he should have scored. Game 7 vs. the Caps started and Sid stepped up. After this goal, it was all business! Watching Crosby after the first two goals, there wasn’t a let down, there wasn’t rest, it was still pedal to the medal. Sid’s focus showed this Penguins team that it wasn’t time to stop but to keep pushing. The Pens soon were up four goals but Alex Ovechkin scored late in the 2nd period. They had some momentum, a small glimmer of hope. The time came, and the leader of the Penguins, put the nail in the coffin came, it wasn’t the hardest goal Sid ever scored. It may not be the most important goal he ever scored. But just as the Capitals and their fans thought there was a chance, Crosby shut the door and ended the series. Lesson one as a young fan…Leadership wins championship. Mario led his team to two Stanley Cups, and in four years in the NHL Sidney Crosby is well on his way to lead the Pittsburgh Penguins to many more.